When I was a child I used to have a lot of curiosity while using a Thermos (or vacuum flask). It was always like magic that it used to keep hot things hot and cold things cold all the time. It neither had fire in it to keep things hot nor ice to keep things cool. Later in high school we learnt the basics of heat transfer, and that was when the theory behind the thermos became clear to me. After so many years, when I think of it, a lot of it can be applied to saving electricity as well. Heating or cooling of a room consumes so much electricity for most people that it feels as if the room was like a thermos which once filled with cold air remained cold for a long time or with hot air to remain hot without needing much of electricity. Conduction: Conduction happens when 2 objects with different temperatures come in contact with each other. The heat transfers from the hotter object to the cooler object. It is exactly how it happens when you touch a hot vessel: your hand is colder than the hot vessel and thus you feel the heat because heat is transferred from vessel to your hand. Convection: Convection happens when heat transfer takes place due to movement of fluids (liquid or gas). Imagine sitting near a fire and the breeze blowing makes you feel hot. The breeze brings the heat from the fire to you. Radiation: Radiation happens through electromagnetic waves. It can even move through vacuum (or without the presence of any matter). Radiation from sun is a perfect example. All objects radiate heat and lots of sensors (e.g. occupancy sensors) detect presence of objects by sensing the radiations. A thermos is designed in such a way that it reduces heat transfer through all the above-mentioned 3 modes. A thermos has double glass walls with vacuum between them. The vacuum between the two walls prevents heat transfer through conduction or convection from the inside to the outside and reverse. Thermos also has a silver lining in the inner wall that prevents heat transfer through radiation as blocks any inner heat to go out through radiation. As per studies (link) maximum heat in a building comes through radiation. Next is convection and last is conduction. About 70-80% is through radiation, 15-20% through convection and about 10% through conduction. The first thing that we need to target is radiation, then convection and then conduction. In a thermos a sliver lining inside reflects all the heat radiation that happens inside the container. Similarly if a room is to be kept hot (in winters), the walls of the room should be reflective. Bright colored walls (white, cream, etc) are good for reflecting the heat. Additionally there are paint additives available in the market that can reflect heat. In summers, the room needs to be protected from radiations from outside. For this the outer walls/roof should be painted with bright colors (white, cream, etc). There are some heat reflective outer paints available in the market. You can read more about it on our article: Reflective roof top coatings can make a home energy efficient by reducing air conditioning load. Even after walls are painted with reflective paints, some heat can come through radiation through windows. There are heat reflective sun films available in the market that can prevent heat from coming in while still allowing light to come through. Tackling radiation will be the most effective insulation that you can do for a building, as radiation is the biggest heat transfer component. Please note, dark colors absorb heat, so use of dark colors will make the walls/roofs absorb more heat and the heat transfer will be faster resulting in greater electricity use both in summers and winters. A good insulation for radiation can stop up to 80% of heating coming in or going out through radiation. 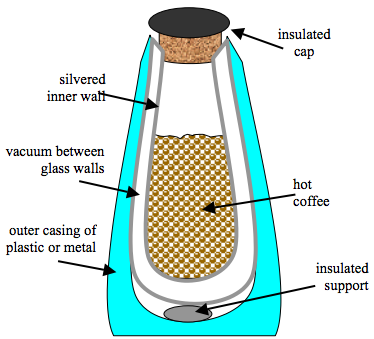 There are two ways by which a thermos stops convection: 1) the vacuum between the two glass walls prevents convection 2) also the cap on the top does not allow external air to come in. Creating a vacuum in the walls of a building is something that can be done during construction of a building. Although a complete vacuum is not possible, but even still air can prevent convection. Convection from roof can also be prevented if a small gap of still air is left between a false ceiling and the roof while making false ceilings. For the windows a double-glazed glass (link) works exactly like the double glass casing of a thermos. A double glazed glass has a vacuum cavity between two layers of glass, which prevents convection to happen. This ensures that the heat transfer does not happen easily between the two sides. Additionally to prevent convection it is important to seal the gaps in the doors and windows of a room. A lot of times we have seen people keeping the doors of an air conditioned room open thinking that the cool air will go out and cool the other parts of the house. But it’s not just the cool air that goes outside, the hot air also comes in and increases the load on the air conditioner, thereby increasing it’s electricity consumption. It’s not right to treat an air conditioner like an air cooler. It is very important to make sure that the doors and windows are closed and the gaps are sealed. This will prevent convection to happen. A thermos prevents conduction by using less heat conduction materials like plastic, foam, etc on the outer body. Even the vacuum prevents conduction. Similarly conductivity of the construction material of a building impacts the amount of heat that moved from outside to inside or reverse. Applying materials that reduce the heat flow can reduce heat transfer through conduction in a building. Some materials that can help reduce conduction are: Extruded Polystyrene (XPS), glass wool, plastic fiber, etc. Of these the ones that can be easily applied even after the construction are polystyrene boards. A good insulation to tackle conduction can prevent up to 7% of heat coming in a room. Concerns about air quality are most common when we talk about insulation to people. Packing a room while saving electricity surely decreases air quality (because the same air keeps circulating in the room). But having said that, using air conditioners itself decreases air quality because air conditioner works on the principle of cooling the indoor air as opposed to an air cooler that cools outdoor air and pushes it inside. If you are someone who uses air conditioners in summers or room heaters in winters, and you are concerned about your electricity bills, then a good insulation can certainly help you.